By Mark - Ecuador - 12 Jan/03 - Viewed 1684 times. We got the overnight Loja International bus from Piura in Peru to Loja in Ecuador. The bus was not quite as luxury as described in the guide books but good enough. Unfortunately the border formalities took hours and started at 1am so we didn't get much sleep. On the bus we decided to make a detour to Vilcabamba for a few days, so when we got to Loja we immediately took a minibus there. This cost US$1.00 each and took about two hours. As soon as we left Loja, the minibus started decending into the lush green valley that surrounds Vilcabamba - The Valley of Longetivity, so called because people supposedly live long lives there. A man with a live chicken in a bag got on. Although the Lonely Planet had promised that this was a regular occurance in South America, this was the first time it had happened to us so we were understandably excited. At the Vilcabamba bus station there was a man from the hotel we wanted to stay at waiting for potential customers and he gave us a lift there. 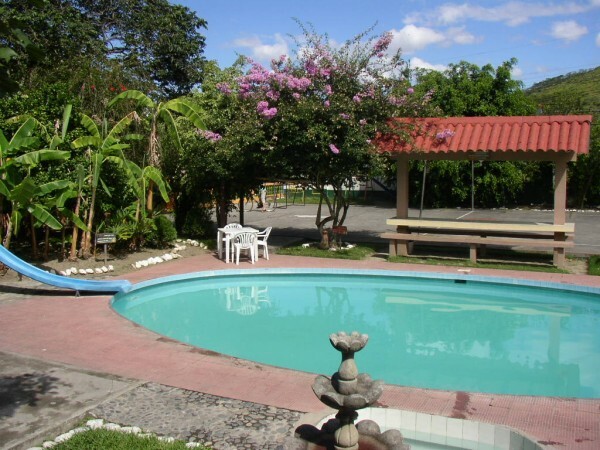 Las Ruinas is more of a resort than just a hotel and a bit more than we normally pay at US$9.00 each including breakfast and dinner. There is also a pool, steam room and jacuzzi. We were only going to stay one night and then go to Cuenca for New Years Eve, but Laura got sick so we spent two nights in Vilcabamba. Vilcabamba is nice but tiny so we decided to go to Loja for New Year. Unfortunately everything was shut in Loja except for clothes shops (of which there are many). The only restaurants are Chicken and Chips places so it was a good job Laura (being vegetarian) wasn't feeling like eating. Some of the roads had barricades made by kids and young boys dressed as woman were stopping drivers and asking for money. Every shop had a lifesize doll made from old clothes sitting outside and at midnight they took them into the road and burnt them. The next day we got the bus to Cuenca. Halfway through the journey we got a flat tyre and they couldn't get the wheel off. Eventually we limped to a village and they cut the bolt off with an angle-grinder. It added at least 2 hours to the journey and when we got to Cuenca at 10pm everything was shut because it was New Years Day. We checked into our hostel, El Cafecito (US$4.00 each, shared bathroom) and got a taxi to the only open resturant in the city which turned out to be an expensive copy of TGI Fridays. We spent four nights in Cuenca but didn't do much. El Cafecito was nice but next door to a disco that went onto 8.30am on at the weekend so we didn't get much sleep. As we had missed the real New Years Eve we celebrated it on the 3rd of January instead. Next stop was Ba�os. You have to change buses at Ambato and we got there about 7pm and got a good view of the volcano (and only view because it was cloudy for the rest of our stay). We stayed at Hotel Dinastia, US$6.00 for both of us with bathroom which was very good value. The next day we hired bikes for a 70km downhill trip (US$5.00 each). As soon as we started out it began to rain. The scenery was good but soon we were soaked and muddy, so when we got to the waterfalls at 20km we decided to call it a day. The waterfall is called The Cauldron of the Devil and does indeed look like a big cauldron. We got a ride back up to Ba�os in the back of a truck for US$1.00 each. That evening we went to the thermal baths (US$2.00 each for foreigners) near another waterfall which was lit up. The water was very hot and it was busy with locals. The following day we got the bus to Quito. We stayed at Daugi's in Mariscal, Quito for US$5.00 each including breakfast. Most of our time in Quito was spent going round banks trying to get enough money to pay for our Galapagos tour. Although we have not had any problems elsewhere in South America, there is only one bank in Quito that takes Visa cards (Banco de Guayaquil) and their cash machines were broken. Eventually we managed to get it sorted after much stress. And, we finally found an Indian restaurant - a real one just like you get in England. The food is very good and cheap (only US$2.00 for the set meal; Onion bhaji, choice of curry with rice and a juice). However, the waiter is possibly the most miserable person I have ever seen. We ate there at every opportunity (although not for breakfast) before getting our flight to the Galapagos.